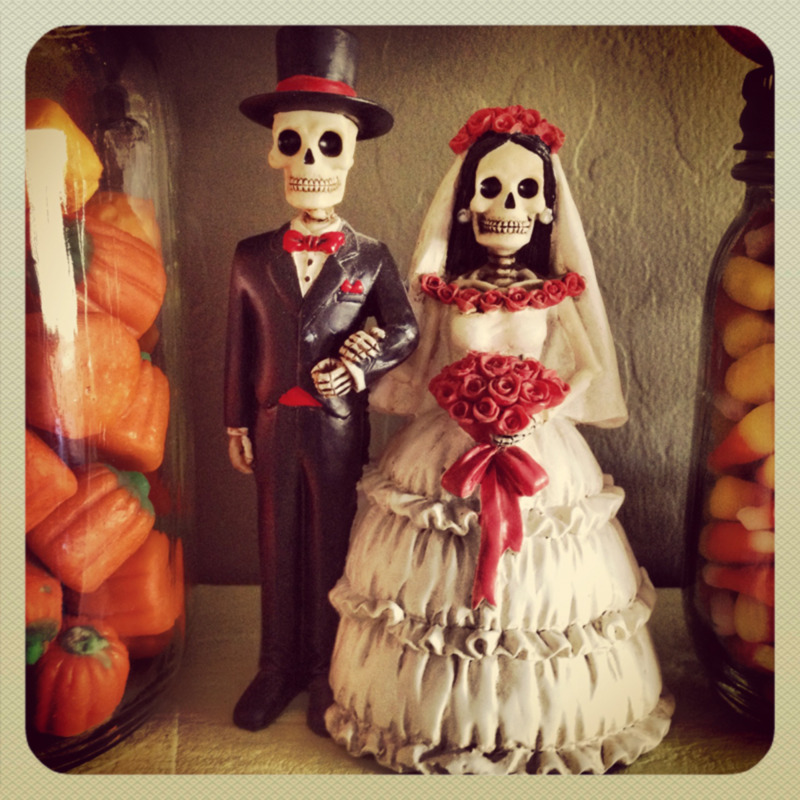 The Day of the Dead (or in Spanish, Dia De Los Muertos) is celebrated on November 1st and 2nd. Day of the Dead skulls and skeletons have become very mainstream in popular culture. 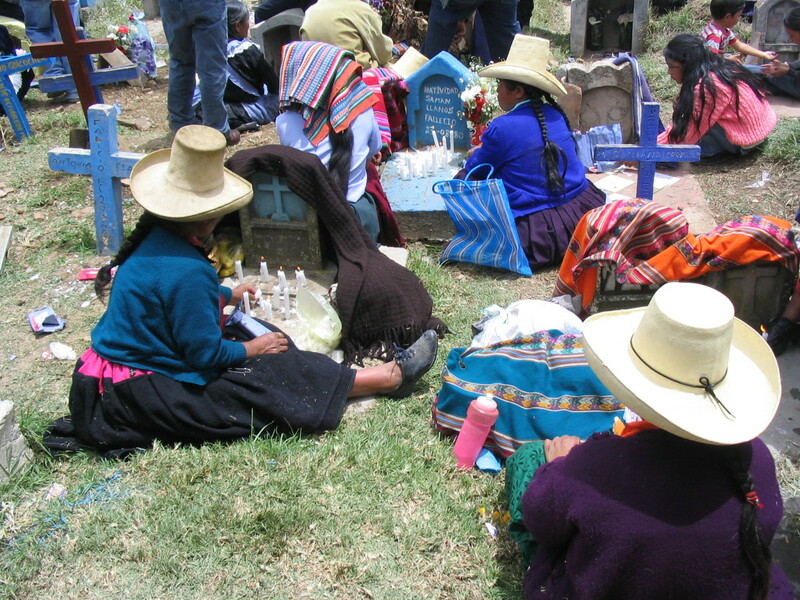 While many fashion accessories from t-shirts to smart phone cases to tattoos are decorated with sugar skulls, I always find myself wondering if the owner of such items is familiar with the celebration and what it stands for. As a native of the southwestern United States, I'm very familiar with this celebration. While traditional decorations of skeletons and skulls are used, this isn't meant to be scary or depressing. This is a day to honor and celebrate loved ones who are no longer with us. I've made the following crafts as I find skeletons and skulls to be lovely. I had a lot of fun designing this coloring page. 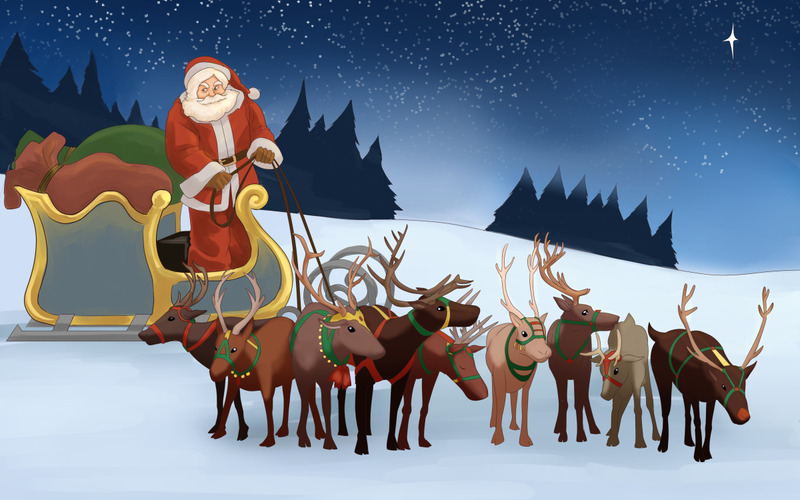 For the original size of this image, perfect for printing, click here. This link takes you to my flickr gallery where you can view, save and print this image in a variety of sizes. Be sure to choose "scale to fit" or "fit to window" if your print preview shows the skull too big or too small. 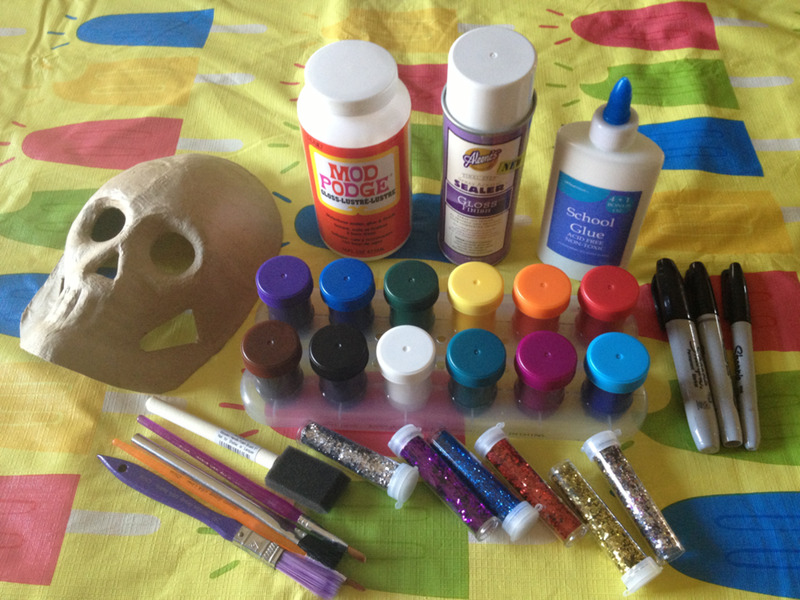 Decorating skull masks to look like sugar skulls is an easy craft that enables you to use supplies you might already have. I purchased these paper mache skull masks from Michael's for $1.99 each. They come unfinished and brown-- like lightweight cardboard. They fit my face nicely and with a few hole punches and some pretty ribbon they can easily be worn as a masks. I attached string at the top when I was finished decorating my skulls so they could be hung on the wall as art. Tear your scrapbook paper up into small pieces, approximately 1"x1". Using mod podge and a decoupage brush, adhere your paper strips to the mask by painting sections of the mask with mod podge and placing paper strips. Paint again, coating top of paper with mod podge. Tear paper into smaller pieces if needed. This can help for difficult areas of the mask. You can also try wetting your paper strips to help soften and mold them to the features on the mask (I did this in a few spots). Use mod podge to coat your mask entirely to seal it. Allow to dry at least overnight. Use paint or marker to draw hair on. Using a black Sharpie marker with a special brush tip works great for outlining features like teeth. You can paint or draw flower petals around eye sockets or use artificial flowers. I used green daisies that I got on clearance at Michael's. Use a pencil to trace mask onto plain paper (trace outside and inside features). 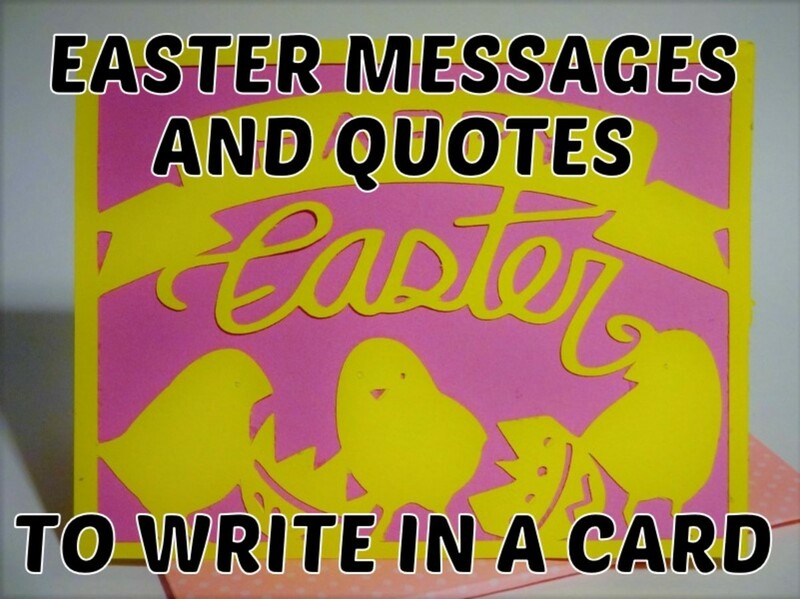 Set paper to side. 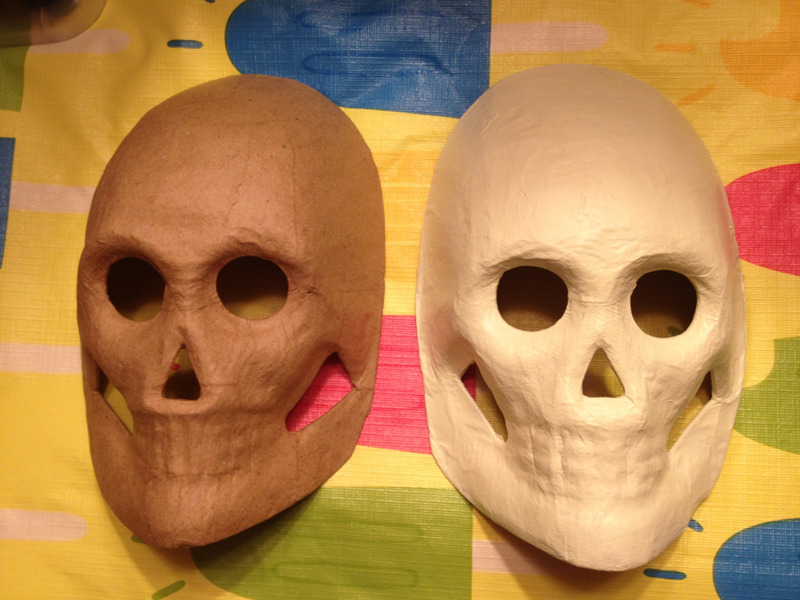 Paint mask white to resemble bone and allow to dry. While mask is drying use paper template to help you decide how you will design and decorate your mask. Use Google images to search for inspiration. I did searches like, "Day of the dead female" since I wanted to decorate a feminine mask. Decide what features and designs you like best and sketch them on your template to make sure they compliment your overall aesthetic. I used traditional shapes like flower petals, hearts, spider webs, and dots. Use a pencil (a mechanical pencil works best) to sketch your design on to your mask. Use colorful paints to decorate. 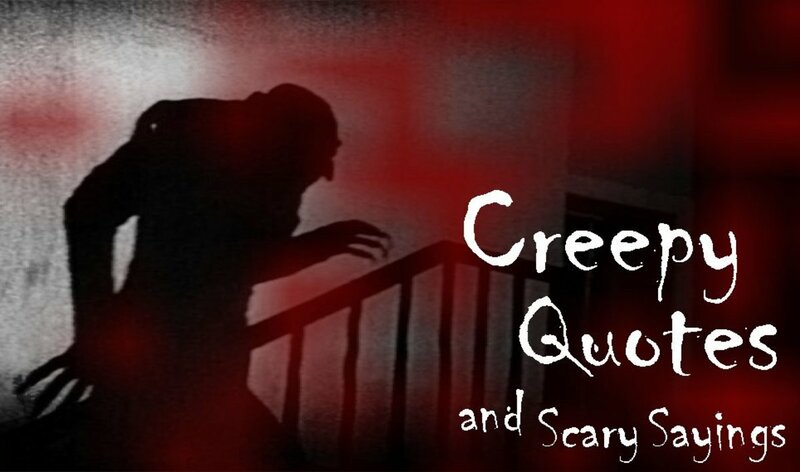 You may need multiple coats depending on colors and paint type. Use a variety of paint brushes to achieve different designs. I found it easiest to use Q-tips when creating dots on my mask. Allow paint to dry. When mask is fully dry, use a Sharpie with brush tip to outline features as desired. Spray with shellac to seal and protect mask. 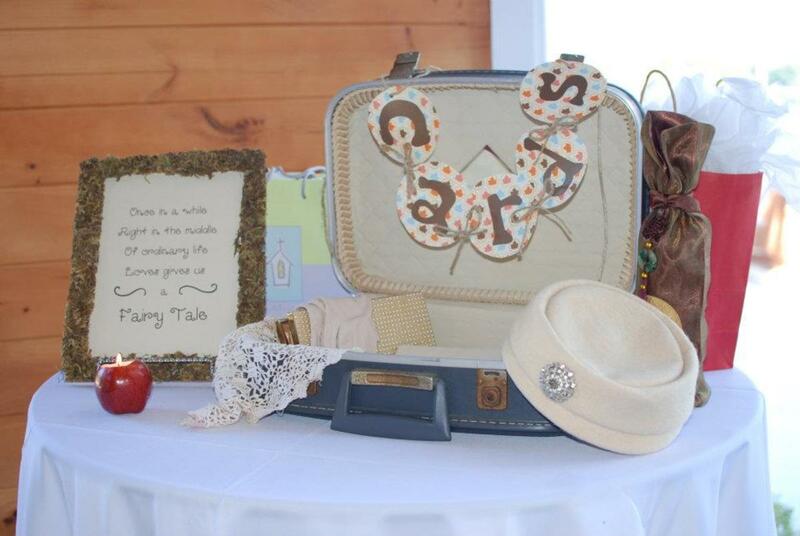 This craft came out quite nice and I didn't have to do anything to decorate it. 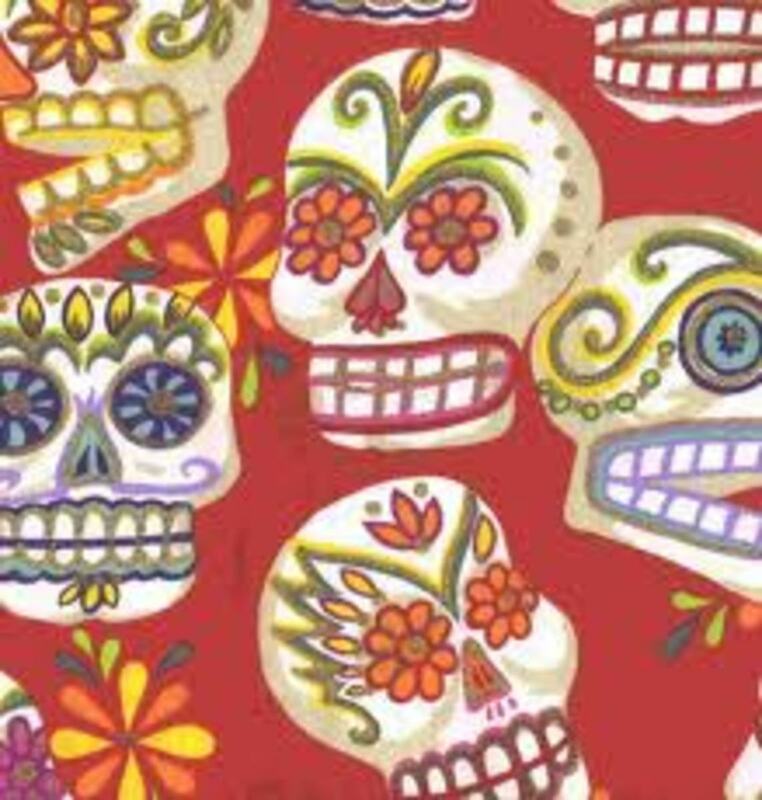 Use beautiful scrapbook papers that give the illusion that your skeleton has been decorated. 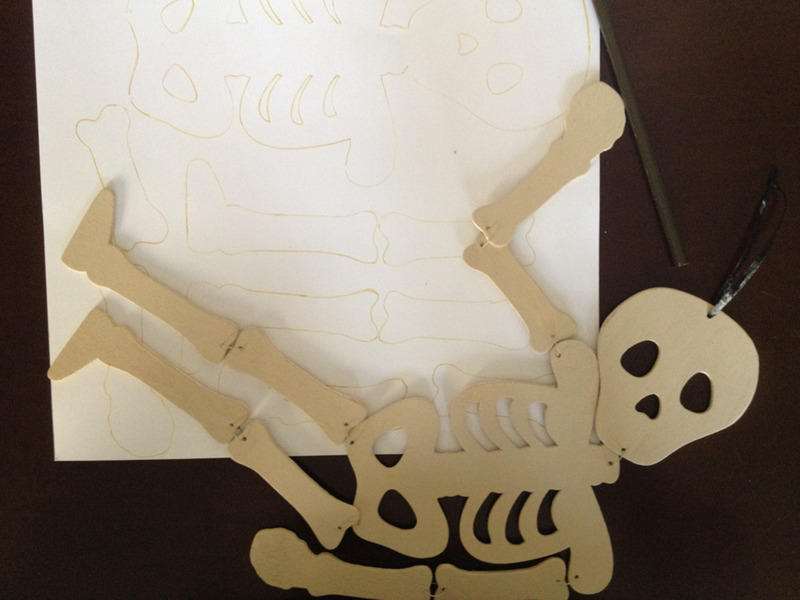 Use a skeleton decoration to trace bones onto back of scrapbook paper. 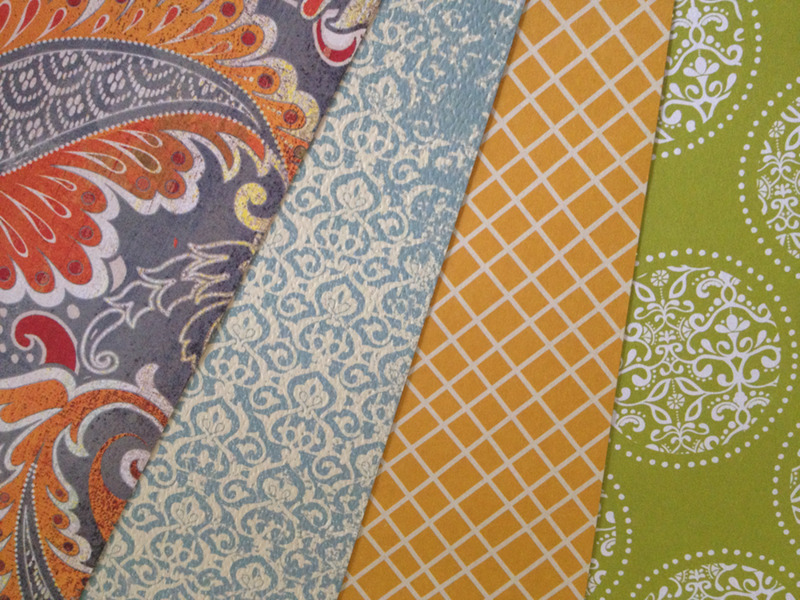 (I used a pretty scrapbook paper that had paisley swirls in various shades of orange, red, cream and grey.) 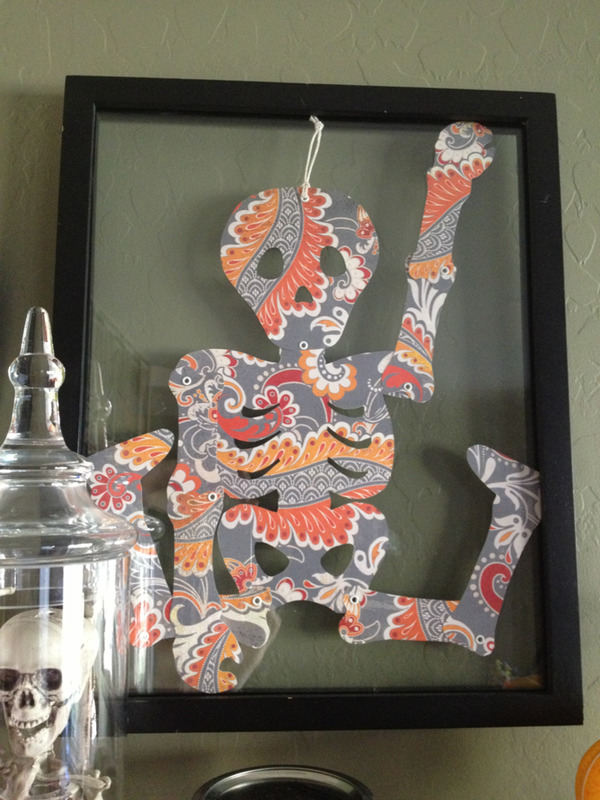 You can use a simple paper Halloween skeleton decoration and you probably won't need to disassemble it. 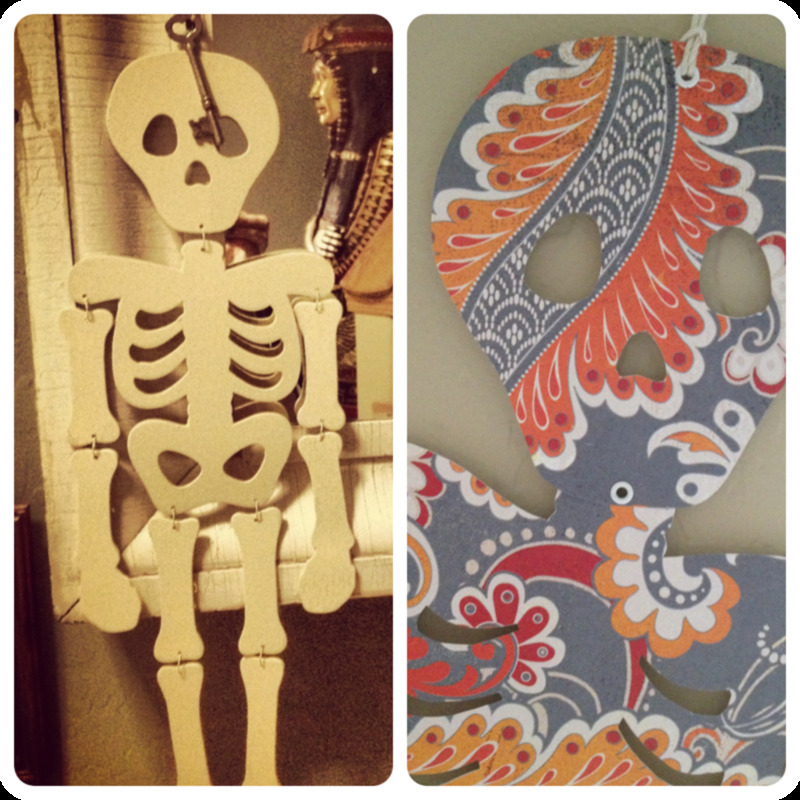 I used a wooden skeleton from Michael's ($1.99). Any spots that I couldn't completely trace around, I just free-handed. Cut out bones with scissors and interior features with craft knife. For children's crafts, interior features can be colored black. Punch holes in bones to connect and join together using eyelets or brads. Decorate as desired. Attach string for hanging. I hung one colorful paper skeleton by my front door and also positioned another to fit into a double glass floating frame and hung on the wall. Carving a sugar skull into a fake polar bear pumpkin is an easy craft that you can hang onto for years to come. 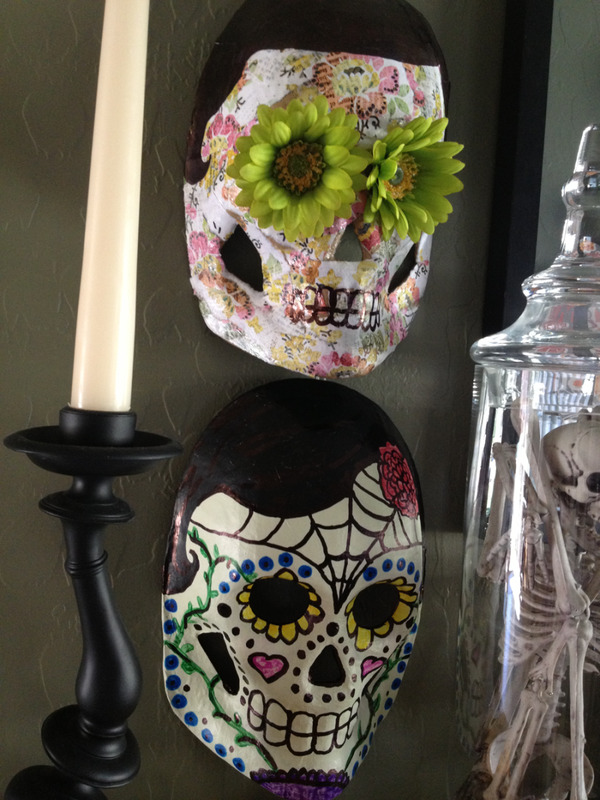 It looks great for Halloween and day of the Dead decor. I enjoy carving artificial pumpkins because they don't go bad or get thrown away. All my hard work can be saved and admired each following holiday. I carved this skull pumpkin about four years ago but you'd never know it because he still looks great. This craft works best with a white pumpkin since skulls are white. It's also best to have a taller pumpkin that is more so shaped and proportioned like a human skull. By this, I mean a very flat squashed pumpkin will not be ideal. I find it makes crafting with fake pumpkins easier if you use a pencil to lightly trace or sketch your design. This is especially true for carving a sugar skull into a pumpkin. 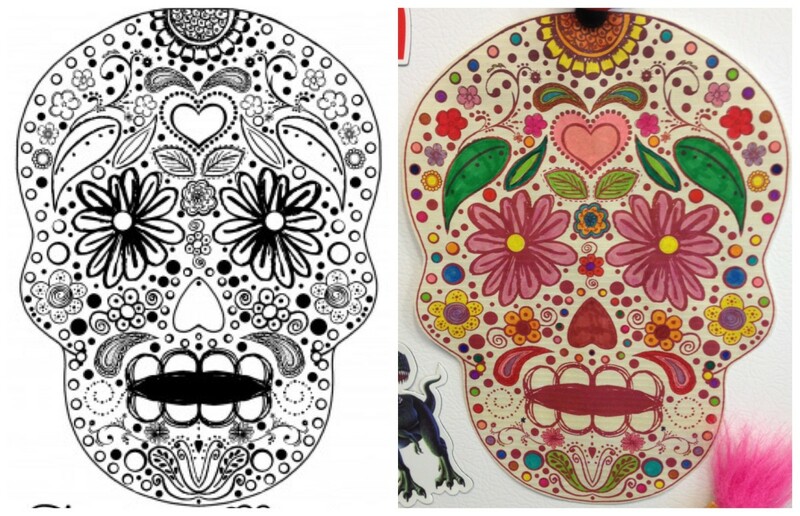 Just like the masks, decorating a sugar skull can go from lovely and ornate to busy and crowded. You can't erase cuts like you can with pencil marks. 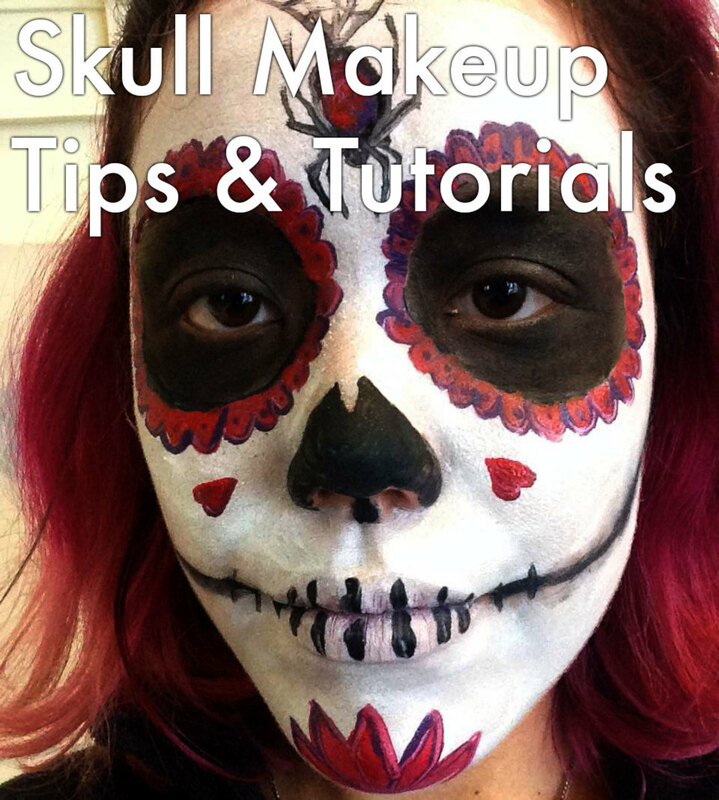 Design your skull using elements that you like and feel that you can comfortably carve. I liked using a heart motif-- I used a heart for each eye, the nose and the middle of the forehead. The most important element of this project would be the teeth/jaw. 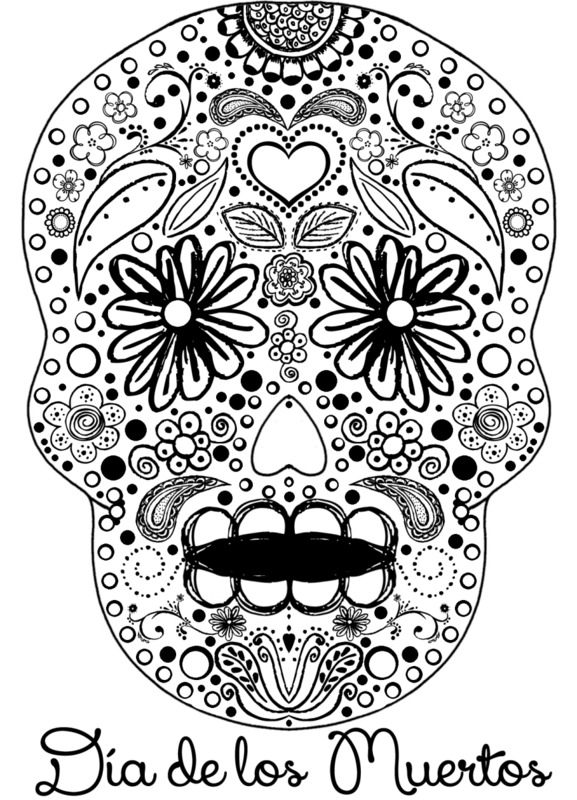 It's important to include this so your sugar skull is recognizable. 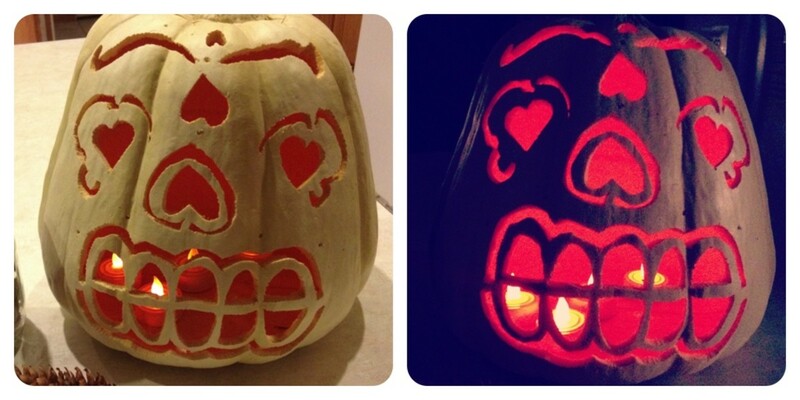 Using a pumpkin carving kit or electric pumpkin carving knife, cut out your design. Tools designed for real pumpkins work just the same for artificial pumpkins. I used an inexpensive set of pumpkin carving tools from Michael's. You will find that certain hand tools in these kits are made especially for cutting certain ways or sections. Refer to instructions to familiarize yourself. If you'd like to put battery-operated votive candles inside your pumpkin to illuminate it, make sure you cut a hole at the top around the stem. Even if you won't be lighting your skull pumpkin, cutting off the top made it easier to slide a hand in and hold the pumpkin when cutting specific sections-- especially fragile ones. Love these! I started collecting Day of the Dead skulls for each loved one I have lost over the years. Now they have crept into my decorating year round. I love your scrapbook paper skeletons. So pretty! Fascinating hub. I've always wanted to more about this day. I have a coffee table book on the Day of the Dead. Love the directions for the mask. Well done! Voted up and pinned.